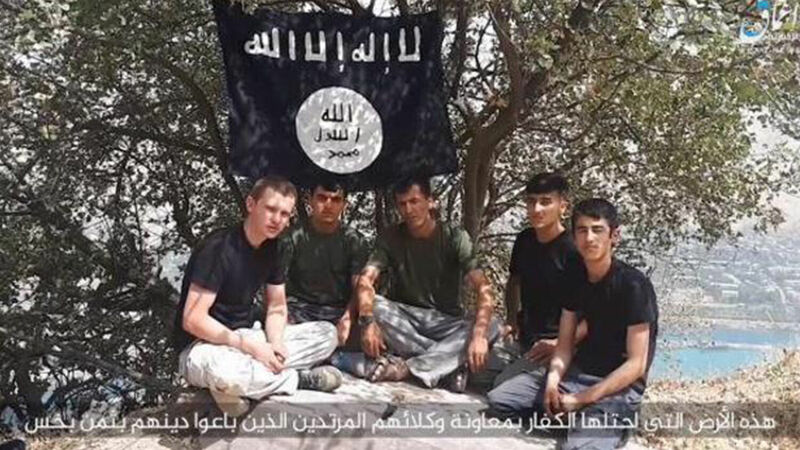 An image taken from a video distributed by the Islamic State on July 31 purportedly shows the militants who attacked Jay Austin and Lauren Geoghegan in Tajikistan on July 29. That’s what Jay Austin wrote on his blog earlier this year. In July 2017, Jay and his girlfriend, Lauren Geoghegan, quit their desk jobs, caught a plane to Cape Town, and set off to cycle around the world. Jay and Lauren were bored with life, with computers and meetings and e-mails; they wanted to experience nature and humanity. “I’ve missed too many sunsets while my back was turned. Too many thunderstorms went unwatched, too many gentle breezes unnoticed,” Jay philosophized. Their blog shows Jay and Lauren’s liberal, idealist worldview. Both were university educated; Jay had a master’s degree. Both were “morally and ideologically enlightened.” Like many progressives, Jay and Lauren believed human nature is inherently good. They wanted to travel the world and experience the inherent kindness and generosity of other peoples, nations and cultures. “There’s magic out there in this great big beautiful world,” wrote Jay. Two weeks ago, Jay and Lauren were cycling in southwestern Tajikistan when a black sedan passed by, then suddenly turned and accelerated at them. There was no time to react. The vehicle collided with its target then sped away, leaving Jay and Lauren dead beside a road deep inside Central Asia. Two days later, the Islamic State released a video in which five Muslim men claimed responsibility for the murder. In the same blog post in which he rejected the notion that evil exists, Jay explained that when “you read the papers … you’re led to believe that the world is a big, scary place. People, the narrative goes, are not to be trusted. People are bad. People are evil. I don’t buy it” (emphasis added throughout). Perhaps the most obvious lesson here is that despite what progressives believe and hope, evil does exist. Jesus Christ, a figure many today reject as bigoted and ignorant, stated 2,000 years ago: “For out of the heart [of man] proceed evil thoughts, murders, adulteries, fornications, thefts, false witness, blasphemies: These are the things which defile a man …” (Matthew 15:19-20). If Jay Austin had accepted Christ’s view of human nature, he would probably still be alive today. In March 1968, the late educator and religious leader Herbert W. Armstrong wrote that while “human nature desires to be good … it desires more to do evil” (Plain Truth). Evil isn’t a “make-believe construct”; it’s a reality inherent within every human being. You can learn more about human nature and its origins in Human Nature: What Is It? But there is a larger lesson here worth considering. To Jay, evil wasn’t real. This meant he either did not understand or outright rejected the empirical evidence proving the existence of evil in human nature. To Jay, man’s history of political corruption, criminal behavior, sexual perversion and attacks, war, genocide and—notably—Islamic terrorism must have just boiled down to differences of opinion. There are many subjects in which truths that were once accepted as reality—that scientific evidence demonstrates to be reality—are now considered a social construct. Today it is common for even elemental basics like race and gender to be considered “social constructs” rather than empirical realities. Many now reject dna and biology and accept that a person’s race or gender was fashioned by society (and is therefore subjective and open to interpretation). This same way of thinking is being applied to traditional marriage and family, to our patriarchal culture and society, to politics and to our justice and legislative systems. Obama and other progressives have described America’s Constitution as a “living document.” To these progressives, the U.S. Constitution is a social construct, a document created in the 18th century, by 18th-century men, for the 18th century (therefore it needs updating). They don’t see that the Constitution was rooted in quantifiable truths, laws and principles. Although it was written in the 18th century, the truths it addresses are timeless, quantifiable and unchanging. Where does this selfish, deceitful relationship with truth end? What is the end result of such anchorless thinking? The Apostle Paul answers in Romans 1. When men reject God and His truth, he wrote, they become “futile in their thinking and their senseless minds were [become] darkened. Claiming to be wise, they became fools” (verses 21-22; Revised Standard Version). Is there a more apt description of man’s intellectual state today? Thinking—no matter how deep, creative or self-pleasing—if it’s not rooted in actual truth, does not make us smarter. It makes us dumber. Want proof? Just look around. There are people among us, university-educated folks, who can no longer recognize the fact that there are only two sexes. Poor Jay Austin had a master’s degree but couldn’t recognize that human nature is full of evil, so he willingly cycled through a dangerous part of the world (98 percent of Tajikistan is Muslim). We live at a time when truth and law are under assault. In 2 Peter 2, the Apostle Peter warned that in the end time false prophets and false teachers would be promulgating what he termed “damnable heresies.” For example, that gender is fluid and changeable. This verse is referring specifically to the presence of destructive false teachers in God’s Church in this end time, but it can be applied more broadly. The ultimate mastermind behind the “damnable heresies” in God’s Church and in the world is the same. In verse 2, Peter warns that man’s relationship with truth in the end time would be perverted and evil. “The way of truth,” he warned, “shall be evil spoken of.” This prophecy is now being fulfilled: In the West, especially Britain and America, the truth—both God’s truth as it is revealed in the Bible and other basic truths, truths once widely accepted—is under assault. If you haven’t thought too much about this topic, you need to. Absolute truth is under assault and you need to know where you stand. What is your relationship with truth? With the quantifiable scientific truths relating to human life? And more importantly, with the most important, precious truth on Earth—the irrefutable, peace-inducing, joy-creating, hope-arousing revealed truth of God?